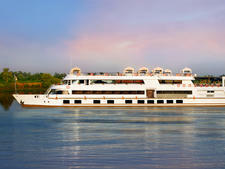 Sanctuary Nile Adventurer is a 218-foot-long river cruiser with five decks, accommodating up to 64 passengers. 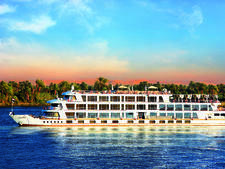 The ship travels the Nile River in Egypt between Luxor and Aswan. 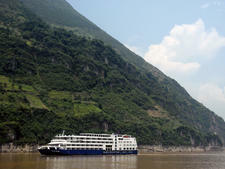 The ship has 32 cabins: 28 Standard cabins, two Deluxe cabins and two Presidential suites. All cabins have Nile views and include a mini-bar, LCD television with satellite plus individual climate controls. International telephone access is available through reception. Each cabin also has a private bathroom with bathtub, shower and hair dryer. Standard cabins range in size from 46 square feet to 54 square feet. Deluxe cabins are 70 square feet. Presidential suites are 139 square feet and include private balconies. Super-king, king and twin beds are available. Onboard activities include an Egyptian cooking lesson, an Egyptian costume party featuring a traditional meal and performances by belly dancers and Whirling Dervishes. The ship has a library and game room with computer and internet access. Complimentary Wi-Fi is available in public areas. A lounge/bar is on the Bridge Deck. The reception area and restaurant are on the Main Deck. Sun decks with teak floors and private cabanas around a small pool are located on the Sun Deck. The Nile Adventurer also has a fitness area, a gift shop and offers massages. Sanctuary Retreats does not have a detailed passenger breakdown by nationality but says most of its passengers are from the United States, the United Kingdom, Australia, Germany and France. 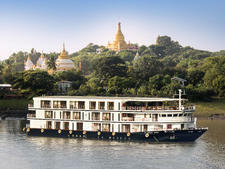 Luxury tour and boutique cruise operator Sanctuary Retreats' 46-passenger Ananda boasts massive cabins, including one for private guides brought on by passengers.